Built originally by the U.S. Army in the early 1850’s, this is the way the Gardener’s Cottage appeared in 1929 with its added wings. Located now on the grounds of the Fort Dalles Museum, the building had two rooms and at first occupied a site near Government Spring (now Amotan Spring) on what is now The Dalles Wahtonka High School campus. The cottage housed the gardener who grew part of the garrison’s food supply, utilizing water from the spring, together with his tools. Walls were of frame-covered (adobe) brick. 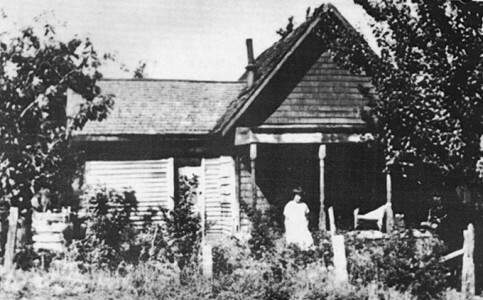 At one time the cottage stood at the corner of 13th and Liberty Streets near the historic Rorick House, and it may have had other sites as well. Minus wings, the building now appears in the original form on the Fort Dalles museum grounds at West 15th and Garrison Streets, The Dalles, Oregon. Historic records indicate the windows in the Surgeon’s Quarters were made by hand on site during construction of the house. In 2010 Amy Harrington McAuley of Oculus Fine Carpentry, Portland, did the window restoration of all the original window sashes of the Fort Dalles Surgeon’s Quarters. Using hand tools to saw and plane the wood, she repaired window sashes and restored the original glass in the windows to its former glory. Removing years of mineral build-up on the windows from rain and sprinklers, the windows of the Surgeon’s Quarters are now clear and sparkling. In 2010 restoration of the stone chimneys and foundation was done by Alan Ash of Ash Stone Masonry of Eugene. The chimneys had begun crumbling and it was becoming important to stop the damage caused by the process of aging. He used local stone and a lime based mortar to restore the chimneys to their original appearance. The roof of the Andrson Barn was replaced and shakes reconstructed as it was originally built, with the shakes nailed directly to the roofing slats, with no paper or plywood beneath. 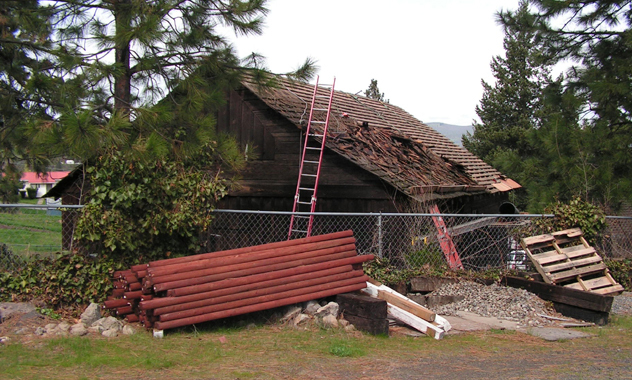 Half of the $12,685 project cost was funded through an Oregon Heritage Grant awarded by the Oregon Parks and Recreation Department (ORPD) and the Oregon Heritage Commission. The grant was matched by museum funds.